With an new concept and the idea "each picture is unique" BilderKing® promises with an selection of million motives and almost infinitely combination options, to build everyone its picture. Beside the enormous selection of motives it is also possible to upload your own photo and arrange it as mural. Selected canvas prints provides suggestions on how to design your own picture. With a new finer structure! You can choose between normal canvas and canvas with primed structure. The primed structure canvas makes your picture more sculptural and gives them a special look. Exclusive Murals of selected artists. Now you can also order reproductions and artprints of motives from popular artists with your desired format. Take a look at the Artist motives overview. Our company is working since more than 15 years in the printing business, while we have specialized on canvas prints and the printing of large scale wall pictures, primarily redistributed through various online shopping portals in Europe. 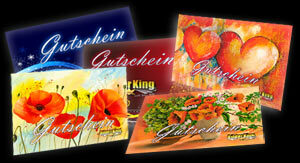 Wether stretcher bars, canvas or printing on canvas - it´s all made in Germany. With the BilderKing® portal our customers now have new flexible possibilities to design pictures by their own ideas and to let them produce cost-effective. More than 100,000 customers and over 250,000 pictures sold speak for us.